It’s heartbreaking to think that people are making snap judgments about whether or not to read your emails based on a quick glance. How can you keep your email out of the trash? The secret is following email design best practices. Let’s take a look at seven common design mistakes that get emails trashed, and I’ll offer more than seven solutions to help your next email get read. Your emails should feature an instantly-recognizable, consistent header image. Over time, your header image will be associated with the high-quality information you share. Ideally, this email header should relate to the business or product your reader signed up to learn more about. So if you’re a dog groomer and you have a special email newsletter just for poodle owners, your header should identify the information you’ll share, and look visually related to your overall dog groomer brand. Your email newsletter’s main goal is to communicate, and — obviously — that happens through words. But what if the words are hard to read? Using fonts that are too small. This is especially important if some of your readers are 50 and over, and may have eyesight problems. And with so many emails being viewed on smart phones, it makes sense to increase font sizes. Using too many fonts. Combining too many different fonts makes your email look messy. Pare it down to no more than two fonts, and just use the italic and bold weights to add variety. Find out more about how to use fonts. Garish color. Stay away from colors that are overly bright or florescent. Tone them down so they don’t compete with your words. Too many colors. Use a color palette with two dominant colors and tone down the rest to make your emails look cohesive. Light text on a dark ground. The most readable combination is dark text on a light ground, so stick to that whenever possible. No hierarchy of information. When a reader glances at your email, they should know right away which information is the most important, what they should look at next, and what’s the least important. Make this obvious by using a larger, bolder and brighter main headline. Make your subheads smaller and less prominent. Make your legal information, notices and “housekeeping” messages smallest and least important. Great walls of text. To make your messages easy to scan, use plenty of subheads. Write in short paragraphs, breaking up your text into easily-digestible chunks. There’s nothing that says “an amateur designed this email” like cheap-o clip art. Avoid cheesy images and stock photography that looks staged and fake. Remember, people want to do business with real people, so use your own photos or stock images that are high quality and look natural. Sometimes predictability is a good thing. Featuring your contact information, your company mission, and your social media profiles in a consistent footer area at the base of your emails makes them look professional. It also makes it easy for your readers to stay in contact with you outside of their inboxes. You may want to tweak your email template after reading this article, and that’s great. I encourage you to improve it! Once you’ve got it looking good, though, resist the urge to keep changing it. One way to keep your emails from being trashed is to choose a look and stick to it for a while so people recognize who the email is coming from in a quick glance. Take steps now to make your emails clear and readable. Use these tips to create a recognizable brand experience with every message you send. 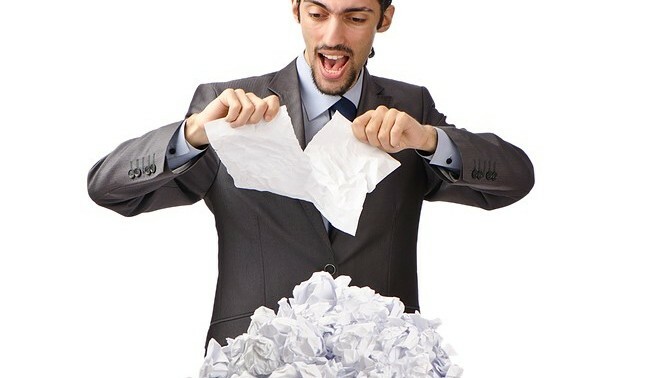 It’s the best way to ensure that the great information you share doesn’t end up in the virtual trash heap. Editor’s Note: This post was originally published in May 2012 and has been updated for relevancy and accuracy.